Press tool simulation has been widely used since the early 1990s. The goal is to take the uncertainty out of the die design process by predicting splitting, wrinkling, thinning, surface defects and springback problems before any metal is cast. International benchmarks such as those hosted every three years by NUMISHEET have proven the accuracy of the method (see also our Publications for further information). Dutton Simulation aims to bring to our clients the benefits of using simulation as part of the die development process by offering the best available software, supported by a range of related services. 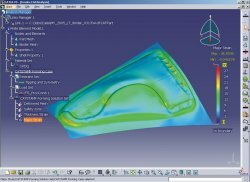 In addition to their superb tools for cost optimisation, product feasibility and process engineering, FTI also offers FASTFORM Advanced and CATSTAMP for detailed tooling simulation. These systems allow rapid evaluation of tooling proposals with consideration of blankholder curvature, blankholder pressure, drawbeads, lockbeads, pressure pads and tooling pins. They also include advanced features such as support for tailor-welded blanks, user-defined blank shapes and even springback calculation. Engineering Technology Associates, Inc. (ETA) is a software development and engineering company specializing in automotive CAE applications worldwide. Together with LSTC, the developer of the general purpose finite element solver LS-DYNA, ETA has developed the DYNAFORM package tailored for solving sheet metal forming problems. Using DYNAFORM prior to tool build can save significant time and cost. The latest version offers springback compensation methods developed in collaboration with the Big Three automotive OEMs in North America. The DYNAFORM package is developed from ETA's core range of general purpose pre- and post-processing tools for finite element modelling and analysis (linear and non-linear) which are also available from Dutton Simulation.